Here’s obviously one of the giant names in classic photography, not only in folding cameras, but in every type, size, and style of photography gear. Sometimes when I PICK UP a Voigtländer Camera or especially an accessory, I have to scratch my head a wonder ….how they could have stayed in business as long as they did! Their products in the main were of such high quality, that you wonder how could they charge enough to stay in business. Well by the early 1960s they were totally gobbled up by the giant Zeiss Ikon Conglomerate – who ironically couldn’t charge enough to match the quality of their photo equipment. But what nice cameras. 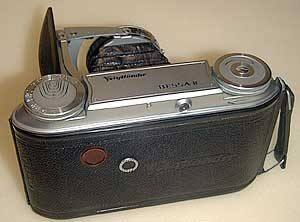 I’ll restrict myself to just two series of folders from Voigtländer – the Bessa and the Perkeo. Of the Bessa series, I focus on the Bessa I & II. Both of these are 6×9 folders taking 120 film – they even share the Color-Skopar lens and shutter. A “simple” 6×9 folder that also allows for 6×4.5 with the auxiliary mask for the film gate. Unfortunately, its one of those accessories that “if it isn’t attached,” you’d lose it. And many people did. I’ll guess that only one in five Bessa I’s still have their 6×4.5 masks. The Bessa I has no rangefinder, just a simple viewfinder that is really quite good. Lenses are either (three element) f4.5/105mm Vaskar or the (four element Tessar type) f3.5/105mm Color-Skopar. Shutters tend to be: Prontor, Prontor S, Prontor SV, Compur Rapid, or rarely, the Synchro-Compur. Vaskar equipped Bessa’s usually have the Prontor or Prontor S, while the Color-Skopar has any except the “bargain” Prontor. The camera does have a exposure-taken indicator, but film winding is via the “red hole in the back of the camera method”, i.e., you watch the frame numbers as the film advances to the next frame. This is simply the crème de la crème of 6×9 folders. It has beauty, style, superb optics, a built-in rangefinder, vaunted Voigtländer quality… this is good stuff. Early models did not have an accessory shoe. Only the last model (1956) had the mask for also shooting 6×4.5. Bessa II’s usually come with either the Color-Skopar or Color-Heliar f3.5/105mm lenses, more rarely with the APO-Lanthar. The Apo-Lanthar lens is so rare that if you see one, it will surely cost a king’s ransom… to the tune of upwards of $1500! Focusing is by turning a focus wheel with your left hand on the top left… the whole lens / shutter assembly moves to focus, like a view camera. Only a handful of folders would focus this way, most simply rotated the front lens element to achieve focus. That’s not a lesser method as most optics today focus that way. On a folder, the Voigtländer (and Super Isolette, Certo Six, Iskra, Super Baldax, Mamiya 6) this method of focus seems to be a tad more precise…. I’m guessing folks, I’m not an optical engineer! 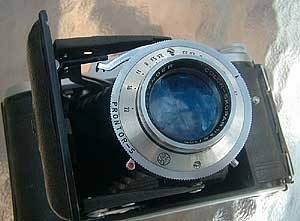 The Bessa optics are first rate, no matter if talking about the 3 element Vaskar, 4 element Color-Skopar, 5 element Color-Heliar, or the 6 element APO-Lanthar. Is a 3 element lens not as good as a 4 element design? Logic seems to say that’s true. HOWEVER, I have received emails from USERS (!!!! ), not the “coffee-table” crowd with their MTF charts, etc. – who swear by the excellence of their 3 element Apotars, Novars, Vaskars, etc. 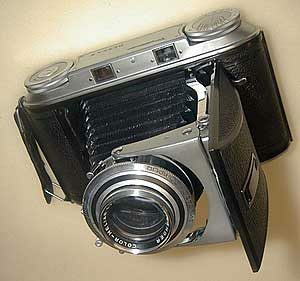 I even had one customer (a semi-professional photographer) who had bought both a Vaskar Bessa I AND a Color-Heliar Bessa II. He sent me pictures to prove that HIS VASKAR outperformed HIS Color-Heliar. It is possible! 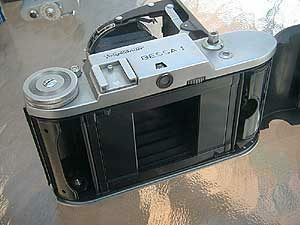 Shutters on a Bessa II are always either a Compur-Rapid or, the Synchro-Compur. On this camera the C-R shutter goes to 1/400th while the S-C goes to 1/500th sec. The other difference is that the S-C shutter has a switch to choose whether you’re using flash bulbs or electronic flash. The C-R is simply synched for whatever you attach to the PC post. One other point to make, especially after 50 years… NO Synchro-Compur or Compur-Rapid has a top speed of 1/400th or 1/500th sec. EVERY single one I’ve had in the shop tested out on an electric shutter tester, at a little better that 1/350th sec… about what the average Prontor S family of shutters will do. In my own experience, both the Bessa I and Bessa II are deserving of the reputation that they have. The Bessa II is a bit pricy, but you get commensurate quality, built-in rangefinder, and superb optics in the bargain. With the Bessa I you get an excellent build quality with excellent optics…”even” if it is “only” the UNDERRATED VASKAR!